Phoenix Phabulous Experience – Artworks PHX – a business-arts campaign in Phoenix, Arizona USA. Phoenix Phabulous Experience shares Phoenix story and vision through community mural collection and storytelling. Founded in 2013 by business owner Carol Poore, Ph.D., Phoenix Phabulous Experience™ is a placemaking organization designed to bring people and cultures together to celebrate the story and urban core of Phoenix. The Phoenix Phabulous History Mural was incubated by Dr. Poore, a native Phoenician and business leader who saw opportunities to tell the story of Phoenix through art and storytelling. 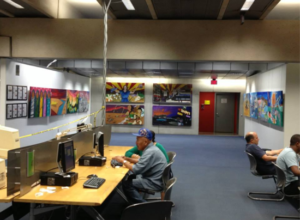 Phoenix Center for the Arts provided the first storytelling event, and local artist Hugo Medina was selected to be the curator for this unique, community-based project. The mural collection artistically represents the past, present and future of Phoenix through nine official time periods of Phoenix history, beginning with the Hohokam civilization. A diverse group of seventeen local, Phoenix artists participated in creating the murals. After a traveling tour to 12 grand civic spaces in and near Downtown Phoenix including Phoenix City Hall, Burton Barr Library, A.E. 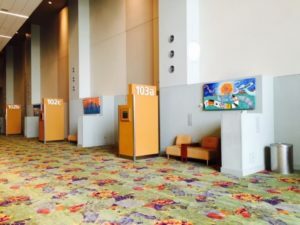 England Building at Civic Space Park, and Changing Hands Bookstore, the Phoenix Phabulous History Mural currently is featured as a long-term installation and first private installation at Phoenix Convention Center’s first floor convention arcade. 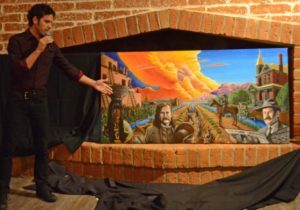 To date, more than 30,000 residents and visitors have viewed the mural collection and more than one thousand audience members have participated at Phoenix Phabulous storytelling events. The website features an archive of story videos and the story of Phoenix noted in nine time periods, including the imagined future.